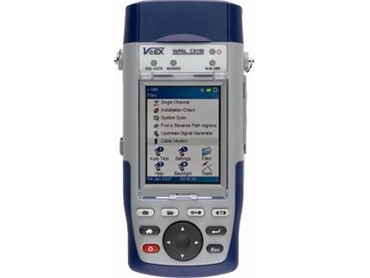 VeEX VePAL CX150E provides the next generation testing solution for cable TV network installation and maintenance of analogue and digital video, cable modem and VoIP services. The CX150E from TekMark comes in a robust handheld package packed with powerful and flexible features for today’s field test environment. It is the ideal tool for field engineers or technicians installing and maintaining tomorrow’s CATV networks today. Its extended battery life and advanced and complete set of features make the CX150E the ultimate tool for CATV network testing. The device has a high resolution colour touch screen with intuitive GUI suitable for reading in any light conditions. The device features FTP and web verification with results uploaded through LAN. It also has an on board web browser, Wifi site survey and internet connection verification, and true DOCSIS modem emulation. The unit comes with enhanced frequency range of 4 -1000MHz, capability to measure QAM 64/256 ITU-T J.83 Annex A digital signals, suite of measurements including single channel measurements, installation check for fast verification, system scan and ingress analysis and Euro DOCSIS 1.0/1.1/2.0 service verifications. Other features include IP Connectivity tests: Ping, Trace Route, Echo Response, DNS support, IPTV function with stream display capability, VoIP suite for performance analysis and call emulation, Wifi site survey and internet connection verification and test profile preloading and/or centrally managed for efficient connectivity, service turn up and verifications tests.